We had two sheds put up this year. One is for animal supplies such as waterers and feeders and the like; the other we have insulated and put in interior walls and trim, so it can be used as an office or dormitory. As soon as Kevin and Brenda, our builders, were done with the shell, I began swinging hammers and brushes inside. Mind you, I'm not a good carpenter, but I try to be persistent and also patient with myself, with the goal of producing results we can live with. We went with 1/4" plywood over wallboard, as I'm so-so cutting plywood and hopeless with wallboard. It took four coats of white to satisfy the family. Toto supervises. To cover the egregious gaps in the plywood, 1X3" was stained, cut and applied along the cracks. A smaller window was cut in, using a glass from an old picture frame, to add a view along the walkway toward the front door of the house. Next we will strip the turf in front of the shed door and add pavers to prevent disaster in mud season. The herb bed has already been lifted and moved to the south side of the shed. One of my all-time favorite things is the Ten Ox-Herding Pictures, an effort to explain in graphics the typical "spiritual" journey of a Zen adherent. The original version is attributed to Kuòān Shīyuǎn (廓庵師遠), a master from the twelfth century C.E., and has been redrawn many times. The one at left is by twentieth century woodblock artist Tokuriki Tomikichiro. The idea is that when we notice something seems "missing" in our lives, we go forth in search of it, and perhaps we find that a certain amount of self-discipline will get us what we think we want. In this case of this metaphor, the Ox represents "enlightenment." But, in the end, there was really nothing missing, the universe (of which we are a manifestation) is one thing, and in full realization of this we begin to forget ourselves and come back to the human community prepared to offer the benefits of this realization. This herding of the ox resembles the process of noticing that civilization is damaging the earth and all its inhabitants, and of seeking an alternative to it. One of the alternatives some find is Permaculture, which with its adumbrated three ethics and twelve principles can be a handy framework for rolling up our sleeves and pitching in. One might regard the pictures as applicable to the process of signing up for (and paying an ungodly amount for) a Permaculture Design Course (PDC), taking the hands-on classes, and receiving a certificate as a Permaculture Designer. The last image, "Entering the village with bliss-bestowing hands," lends itself to that nicely. 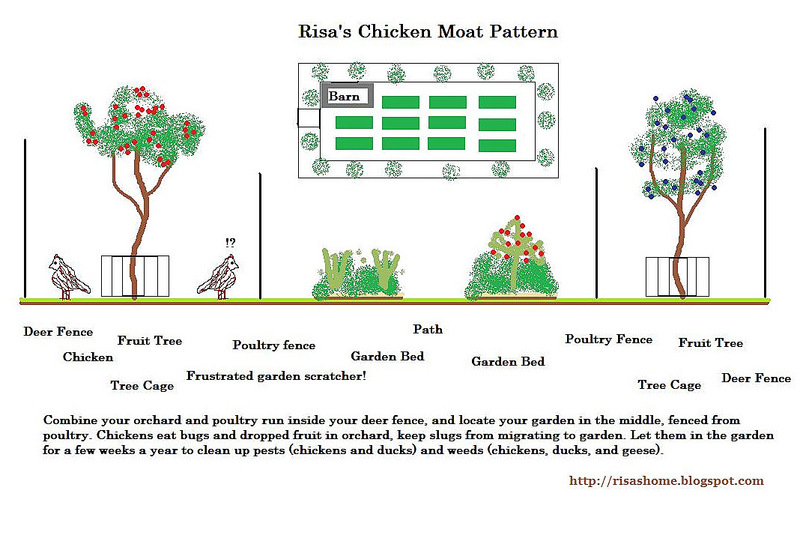 I'm not going to tell you not to go do this; we probably need all the Permaculture Designers we can get. I think there are some adjustments that could be made to the current system; correct me if I'm wrong, but doesn't it seem a little as if PDC teachers seem to be certifying more PDC teachers than keyline diggers, gardeners and foresters? Not everyone has all skills, and for a community to adopt a solution there may have to be some division of labor. After a change of heart (mind), it's a good idea to also have a change of hands. As in calluses. Toby Hemenway wryly notes the relative success of Transition as opposed to the PDC model, and points out that Rob Hopkins, the movement's co-founder, is a certified Permaculture Designer. He's kind of quiet about it, though. People tend to organize themselves in ways that are already familiar to them, and he's figured out how to play to that. The genius of Hopkins' approach is that at first it's rather like organizing a Garden Show. Folks get together to eat, play music, watch a puppet drama, swap plants, and treat themselves to a not-overlong whiteboard session on how to muddle through should industrially-induced scarcities (of energy, food, affordable housing, clean water) threaten to strike in their neighborhood. It's issue-oriented and open-ended. The open-ended bit is where the power of this approach lies. At the initial event, roles are propagated and a date fixed for the next get-together. And the next. Instead of a six-week intensive, it's a lifetime community learning experience, with coordinated action to build resilience into the group, the group's families, friends, neighbors and beyond. Also, the "authorities" seem to have relatively little problem with Transition as a manifestation of community spirit. It seems a bit like the Rotarians as seen from the outside. Any time you can get the mayor to attend a ribbon-cutting for a storefront food-and-gardening supplies cooperative or a labor exchange is a definite plus. 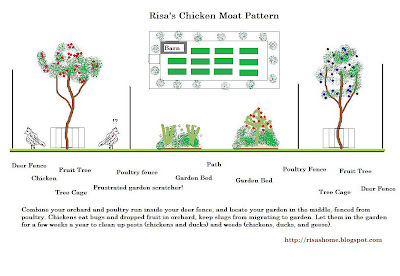 Those bearing a PDC certificate who set themselves up as a teacher of PDCs or as a small business -- an independent site designer helping owners start their polyculture gardens and food forests -- are doing a good thing. Not only does the world need all of this it can get, it fits under Right Speech, Right Action and Right Livelihood. Getting paid to do it means not starving, as well, which fits under "Obtain a yield." I think, though, that last picture in the ox-herding series contains one more step. "Entering the village with bliss-bestowing hands" involves the whole village and involves a gift-giving, gift-exchange local economy. This is neighborhood action, and it can take diverse forms; many of those involved will have never heard of Permaculture or even Transition Towns. Yet aspects of either will be found throughout, because good principles have a way of showing up, simply because they are often already known to be the best way to do things. Tradition can be a stumbling block but it can also be a guide. Folkways often embody winning strategies. Recognizing that the universe is one thing and what's going on is not primarily about me, I find myself doing what I know, as it seems time is short. It may not be the whole Permaculture enchilada, but the village is all around me, the day is wasting, and there are calluses to be earned. As to prepping: when it really hits the fan, there will be rationing, first in one place and then another. As that comes your way, you'll encounter increasing propaganda as to how prepping is really hoarding. You know what hoarding is; it's irrational storage of stuff you're obsessed with, to the point of your being unable to function well -- you can't get to the bathroom because your heap of Pez bottles is in the way. 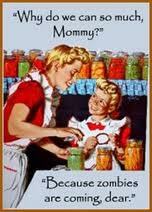 There's nothing irrational about, say, food preservation: canning, drying, freezing and fermenting your produce. 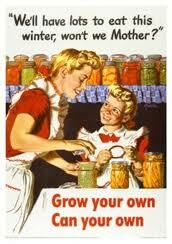 Or buying farm produce cheap at the height of the season and processing it yourself in batches. They're gonna yell at you anyway. You should be buying stuff (with your ration card) at the supermarket like everyone else; who do you think you are? Get in line! 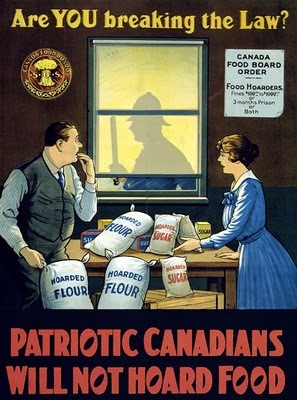 World War II home front propaganda posters made the distinction; those stocking up sacks of flour while others did without were in violation of the law; but those who could produce extra food for their families were encouraged, as that much more food could then be sent where it was needed. So this rationing thing is meaningful up to a point, particularly in the cities. (watch Wartime Farm, especially the later, more desperate episodes.) If half the people in a siege have food and the other half don't, it gets harder -- much harder -- for everyone to pull together. But there has always been, even in fourteenth century Europe, the hope of the siege lifting, and life returning to "normal." Infrastructure as we currently know it is not built to stand up to the coming changes, and it looks like we cannot afford to upgrade. People, especially in urban settings, may begin to misbehave. Preppers may be overwhelmed, and it will be at that point that they'll appreciate that the zombie movies were a horrendous metaphor. And then what, you may ask. Well, no one lives forever. If it comes to it, as I yield up my last jar of pickles, I may have to assume the role of Mother Shipton. There can be satisfaction that, too. Between now and then, just in case there's any such thing as a soft landing, or just because it's the right thing to do, improve your odds too of being useful to yourself and others. Observe the changes and interact with your human, plant and animal neighbors in a resilient and respectful manner, adapting as as you go. Find non-grid and non-fossil-fueled ways to catch and store energy, and prepare to share these locally. For as long as possible, feed yourself and not just others. Accept criticism, especially from yourself. Promote and exemplify the use of renewables, making no waste to the extent possible. Follow natural patterns and cycles, integrating yourself with your surroundings and recognizing the ultimate unity of all things great and small reveling in the diverse forms this unity can take. Work the margins and roll with the punches. Personally, as I resolve to live by the Permaculture principles above, I also resolve to see, feel, say, act, work, strive, think, and focus wholeheartedly while I can. One does not have to make a religion of it. Sitting and watching a sunset, then washing the dishes before retiring for the night, are momentous things. When the time comes that I can no longer do such, I would prefer to go well, and to be remembered as having been more a help than a hindrance to those around me. Habits of urban, suburban, and, in my area, even rural people are: drive to work (or the unemployment office), gas up the car, get groceries, maybe eat out, come home, watch television, meanwhile going farther and farther into debt. But suppose you lived close enough to your work to commute via feet, bicycle or bus (or train), grew (much of) your groceries and foraged as well, and allowed these activities to take up 'TV time'? Maybe a little less debt? If the neighbors will permit it (perhaps by letting them in on it), what about grapes and kiwis on the back-lot fence? If the city or borough or county or parish doesn't mind, what about gardening the front yard, the right-of-way strip, the odd triangular bit on the corner that's not part of anyone's city lot? I volunteer at a small state park that is severely underutilized, and the rangers have tacitly offered me all the filbert poles, filberts, apples, black walnuts, wild mustard, and the like I can gather when my gorse pulling is done. When I walk the dog, I wear a cloth bag over each shoulder and explore the pasture fence lines of the neighborhood. Apples, crabapples, rose hips, Oregon grape, and acorns are the current crop. Earlier there were plums. When I lived alone in the city awhile back, I lived mainly on rice from a steamer, but added diced apple, quince and Asian pear slices, dandelions and lamb's quarters, with traces of lavender, mint and rosemary, all garnered from abandoned strips in the alleyways. There was even kale. My entire budget that year was four hundred fifty dollars a month. Most of my earnings were sent to the home place to help retire the mortgage. 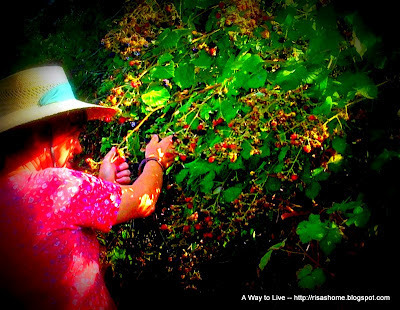 Here at home one fence line is turning into a hedgerow, and affords blackberries, Oregon grapes, grapes, crabapples, wild cherries, beanpoles, and composting materials. The seasonal creek's banks provide all that plus firewood and stones. I take my filbert (ok, hazel), willow, ash, maple and even Japanese knotweed poles to the compost heap and strip the leaves into the heap before moving on to the trellising. From the garden we get all the usual things but also dandelions and other delicious weeds, popular with the chickens, as well as plantains, red clover, and other medicinals. Any part of the 'yard's' margins not doing anything else is put to work raising comfrey for the poultry and the compost heap. Watch the seasons in these places. For Buddhist purposes, this post is under 'right seeing' and 'right awareness'. In some parts of the world, as well as among some marginalized populations in this country, all this is routine. Learn from those whose native language is not your own, learn from the parks, stream banks, abandoned lots, fence lines, property boundaries, edge plant communities and feral animals. What works for them? Maybe it will work for you. Principle 11: Use edges & value the marginal. “Don’t think you are on the right track just because it’s a well-beaten path.” The interface between things is where the most interesting events take place. These are often the most valuable, diverse and productive elements in the system. Despite what some may tell you, human diversity is a strength, just as having three toppings on a pizza provides a greater range of nutrients. But I'm about income here ("Obtain a yield"), i.e., clean earth, clean air, clean water, relatively clean fire, good clean local food, low-impact shelter. It's worthwhile to widen the variety of vegetables, cover crops, shrubs, trees and livestock to be found on the premises where you do your food scene, as monocultures, such as only doing tomatoes, results faster depletion of specific nutrients and trace elements, which may lead to dependence on bought-in fertilizers and supplements, possibly damaging your soil and your watershed and affecting your health and that of your neighbors (including beneficial wild species in your biome). Apple juice tastes better when you use range of varieties in the press, perhaps including crabapples, but what about throwing in a pear, a pawpaw, two or three persimmons, a handful of goumis and some grapes and blackberries if they are on hand? You're on your way to creating a health food made up of what's happening around you, in much the same way as a bear, passing through the woods and over the streams, assembles a varied diet from huckleberries, salmonberry, thimbleberries, Oregon grapes, mushrooms and salmon. Try it both ways, offering traditional apple juice to visitors (so as not to throw them for a loop), reserving the more intense stuff as a "medicinal" concoction for your own needs. You may find yourself more resistant to a range of diseases in this way. A cherry tree can do many things for you, as can a maple tree, but each does it differently, with different end results, and with some overlap. We have both residing on the south side of the house, for shade, and have added butternuts and figs in the same area. And who's to say this is not beautiful landscaping? And it can be an exercise of right seeing, right action, right livelihood, right awareness to study your surroundings and discover how yet another vegetable, herb, berry bush or tree fits into your surroundings, and its products into your life. What things like partial shade? Which ones tolerate tree roots? Which "weeds" should I encourage? What do I do to get unsprayed filberts without worms (catch them on a sheet, not letting them touch the ground)? Who is around to trade vegs and seeds or sell me a pair of ducks for the slugs? I don't have enough land (patio, balcony) to do any of this ... do we have allotments, community gardens, vacant lots in the neighborhood for the use of which I can sign up or negotiate? Does the city give away leaves? Should I build a bike trailer to go after them? Is it legal to add a beehive here? If not, can I change that? In every aspect of life, asking how one thing can do many jobs, or many things can do one job may add resiliency, which may be superior to its opposite, efficiency, in increasingly chaotic circumstances. 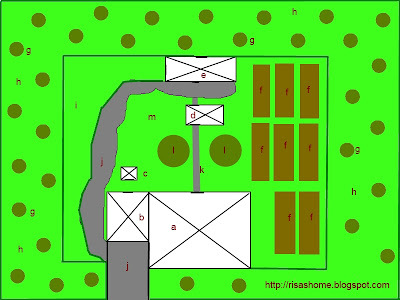 a) House b) garage c) wellhouse d) garden shed e) barn/poultry house f) garden beds g) fruit trees h) chicken moat i) optional goats/sheep j) truck access k) walkway l) shade trees such as mature cherry or walnut. Not shown: plantings of tea, spices, berries, grapes, lavender, etc. m) place for humans to zone out. 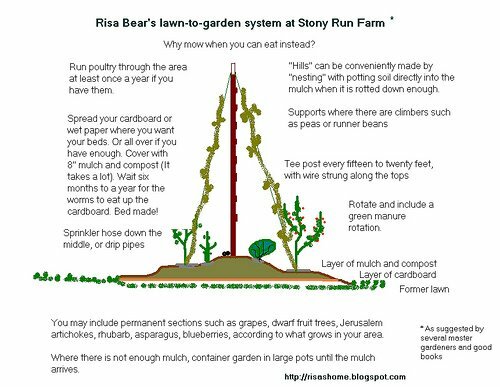 Perhaps you wish to do these things and cannot access land of your own, a rental, or a community garden. In that case, you might try what Aaron Newton did in his neighborhood, and which he reported on in my all time favorite blog post by anyone ever. The generation now in charge has mostly not read E. F. Schumacher, which is a sad fact. My copy of Small is Beautiful: A Study of Economics as if People Mattered (Perennial Library, 1973) is forty years old; it's a crumbling paperback, yellow and a bit musty, that has traveled with me, long un-reread but treasured, crisscrossing the Northwest with me when I worked in the woods, and the nation when I worked in Pennsylvania. The subtitle of the book is "Economics as if People Mattered." Schumacher was Catholic, and regarded St. Thomas Aquinas as the underpinning of his understanding of science. He knew that much of his audience would be unwilling to hear him if he made much of this at the time, so he devised a clever and famous chapter, "Buddhist Economics." (Emphasis mine.) A discussion framed in Buddhist terms served his immediate aims just as well as one framed in Christian terms, for his point was that economics ought to serve humanity and not the other way round; and economics cannot serve humanity on its terms, for that which makes us human is unquantifiable in dollar amounts. To the objection that local people from a one-dollar background have no buying power, he answers that with the ten-times-cheaper-than-industrial-scale one-hundred-dollar workplace,you can do ten startups simultaneously, with the goods from one workplace affordable to the workers in one of the other nine. They still exist, as the nonprofit Practical Action, thirty years later. What is wanted is accessible knowledge, the kind created not for but in cooperation with rural populations in "Third World" countries, the kind of knowledge that takes root in the heart of the woman or man who says, "yes, I can do this." And we are all and have always been the "Third World," whether we think so or not. The Permaculture site that we're following in this meandering series of posts discusses Principle Eight mostly in terms of interpersonal relationships. Anyone watching an Amish barnraising will get an inkling of the truth they're driving at here. It's also true for plant and animal communities. I sometimes mix a batch of the smaller seeds in a spice shaker and plant on a hexagonal grid, with one-foot intervals or so. What come up, comes up. After maybe one thinning, I let the bed design itself. What we get is more insect resistant, utilizes water more efficiently, stands up to heat and cold better, and utilizes the available nutrients more -- companionably, seems to me. 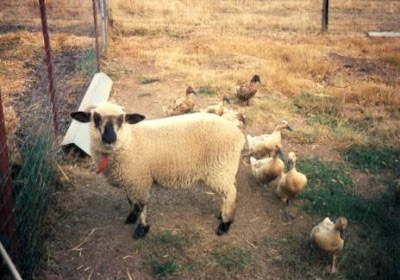 The chickens and ducks roam the surrounding orchard, cleaning up fruit and pests, and are allowed to rake over the beds in winter. I've planted firewood trees in the orchard, as well, and the chickens inspect the downed coppicings as I separate them into compost, hugelkultur pieces, beanpoles, kindling, and sawlogs. At the farm where my son works, everybody is cheek-by-jowl all the time; it's good for them and they certainly get a lot done. I'm, from most people anyway, more isolated, perhaps by choice; it's a mixture of introversion and severe hearing impairment, partly. but I claim the company of the garden, orchard and flock. Plus the joy of handing over a dozen eggs to the occasional visitor. I will admit to being a moderate grump here. A while back I objected that while Permaculture Principles seemed sound, images of people doing those expensive teach-ins called PDCs (Permaculture Design Courses) seemed to me to evince an attempt to revive the touchy-feely sit-in-circles-and-gush stuff that went on in the Sixties. I'm just ... not there. With a suspicion that one shouldn't participate in anything that can lend itself to accusations of being a pyramid scheme and, to some extent, a cult of personality. Toby Hemenway has a terrific discussion of the success of Transition, a movement that incorporates Permaculture Principles at every turn but appeals to folks more than does Permaculture as a movement. He notes that Transition uses, or appears to use, recipes where a Perma guru seems to try to make a chef of you on the spot. I would add that in Transition your town still looks familiar after the measures have been adopted, rather than being taken over by crystal gazers, spiral gardens and ferny forests -- it's more ... comforting. And somehow seems less likely to spark derisive opposition from some parts of the political spectrum. Perhaps Permaculturists should notice how integrative TT is. You must begin with the communities that are already there, I think. Where all this fits into Buddhist principles is not so much with the Dharma wheel (Eightfold Way) which is a pattern for individual ethics, but with what are called the Three Jewels. "I take refuge in the Buddha (Gautama as teacher, Buddha-nature as teacher); I take refuge in the Dharma (the teachings); I take refuge in the Sangha (the fellowship of those who follow the teacher and the teachings)." In the Sangha we have an ancient example of an articulated system to support the dissemination and practice of the ethical system of Gautama. It's not without its abuses, however, humans being what we are. Hierarchism, as elsewhere, may be to blame; sexism, racism and even genocide are the consequences of people holding themselves to be separate from and higher than. Between touchy-feely and strife, hold a middle ground: work together for the good of all the waters, soils, winds, the plant and animal communities, holding every child, woman, and man to be your neighbor. Principle 8: Integrate rather than segregate. “Many hands make light work.” By putting the right things in the right place, relationships develop between them and they support each other. Remember A Pattern Language? 1977! It's still out there. I remember the review in Coevolution Quarterly. I instinctively felt that, while the author was limiting himself to articulating home, neighborhood and city construction onto observable natural patterns and cycles, the underlying principle (observe, then imitate) would be applicable to any human endeavor. 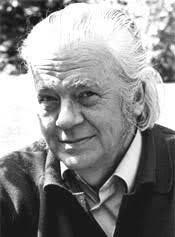 I immediately became interested in Margaret Mead, Gregory Bateson and other scientists who were investigating positive feedbacks in loop systems (Cybernetics, Systems Theory). Take the illustration above. Remembering that a species that discovers and adapts itself to a reservoir of food or water (as opposed to an income stream from an offsite source) will exploit that reservoir, explode in population, and then die off, I created it as an activist statement arguing that we should move from fossil fuels to renewables. The "poster" does say "leave it there" but doesn't get into what happens (by way of temperature regime) to the oceans, the soils, the atmosphere, the biosphere, and us, if we don't (the stuff being absolute poison). I really only argue the danger of living off principal rather than income, which should be sufficient information right there. And the income sources imitate nature: the solar panels, for example, are at least partly an analog of chlorophyll. Systems Theory is very clear on how all this works, but you don't have to be a scientist to follow the argument. If you have a checking account, try living on principal without income. One day a check bounces. Welcome to the scintillating world of dumpster diving and dying under a bridge. In Permaculture, one captures revenue streams by imitating nature: all twelve principles speak to this, so you know Permaculture is, in its disarmingly homespun way, a return of the somewhat disenfranchised (the Reagan Administration moved purposively to defund the entire field) science of Systems Theory. For a particularly comprehensive application of pattern languages (Permaculture Principles, Right Work (alla same) see this remarkable series of little videos. They are also available in Japanese. Here is his channel. Let's consider two Permaculture Principles at once, as they are difficult to consider separately, in my mind. We have all heard of "reduce, reuse, recycle": the waste hierarchy. This is where the idea fits into Permaculture, as principles number five and six. It also fits under Right Awareness in the Eightfold Way, as wastefulness is thought to be a prime indicator of an unenlightened life, showing disrespect for the universe and its inhabitants. There is a story of three Zen monks seeing a succulent vegetable leaf drifting down a stream, and they discuss among themselves the likely heedlessness of whomever tossed it away. Then along the riverbank comes another monk, running with a hooked stick to retrieve it! When designing a "permaculture" system, we are designing an "awareness" way of life, with efficiencies built in. At Stony Run, we compost everything we can right on the garden, as part of the sheet mulch. But because chicken and duck manure should not be put on the beds during the growing and harvest times, we also maintain compost heaps. To these we add whatever food "waste" we can, plus grass clippings, plus leaves, and even the leaves and twigs left over from firewooding and pruning. Sticks may be woven into "wreaths" that encircle fruit trees; sawdust is collected as we make firewood and brought to the berry beds. Longer sticks provide for trellising, after which they may become kindling or be buried in the beds where they stood, as Hugelkultur smallwood. Comfrey grows at the feet of fruit trees, bringing up minerals for the tree roots and serving as a drought indicator, then is cut for the poultry until they don't want any more, the rest being added to the sheet mulch or steeped with willow bark to make growth tea for young plants and cuttings. I use a stock pot of well water on the wood stove to soften pumpkins for the chickens, then use it for water bath canning, then pour off the hot water into a tub in the kitchen sink to pre-wash the canning dishes, then pour the triple-used water into a bucket that holds coffee grounds, food scraps, vegetable trimmings and the like, which I carry out to the compost heap. Maybe I overdo it, hey? But it's not like I was doing anything more important at the moment. And if we think about this, a lot of our ideas about "more important" come down to "self-important," i.e. not really important after all. Might as well be carrying the water from the stove to the kitchen, then. Do without. What you cannot do without, find ready to hand; what you cannot find ready to hand, make; what you cannot make, borrow; what you cannot borrow, rent; what you cannot rent, buy used; what you cannot buy used, buy local from an artisan, what you cannot buy local from an artisan, buy highest quality, cooperatively, and share. Maintain with care, and dispose of carefully. If possible, so manage your project that there is no waste stream at all leaving the premises. Whatever has been dug from the earth is difficult to return to the earth in an adequately respectful manner; so it is both good Permacultural and good Buddhist principle to always distinguish use from abuse, touching the world sparingly. Principle 6: Produce no waste. “A stitch in time saves nine.” “Waste not, want not.” By valuing and making use of all the resources that are available to us, nothing goes to waste.